Luxury Vinyl Planks (LVPs) continue to make a significant indent in the flooring industry, and undoubtedly, your clients will increasingly specify this type of flooring. Peta Smith at FloorworX guides designers, specifiers, contractors, architects and their clients on their projects by answering the top 10 frequently asked questions about LVPs. 1. 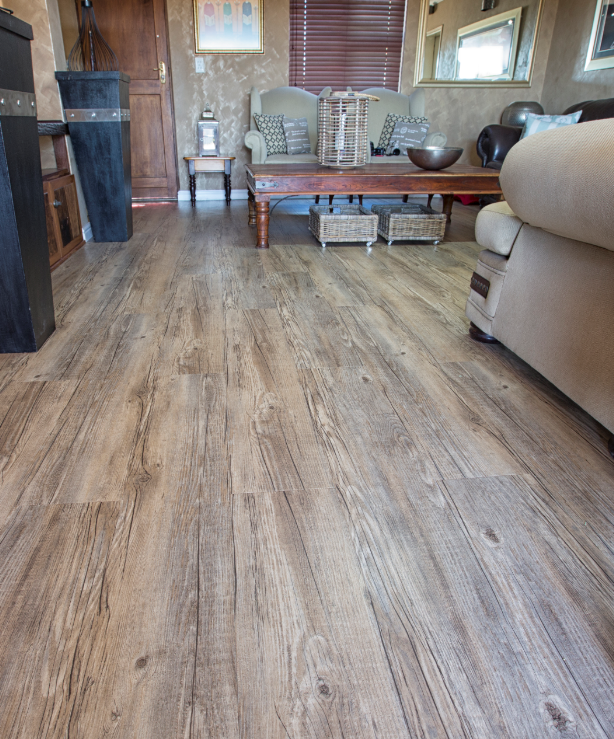 Is there a difference between Luxury Vinyl Planks and Luxury Vinyl Tiles – which is the correct term? Planks refers to a product where the two opposite sides of the plank are longer than the other two sides, giving you a rectangular product finish. A tile would have four equal sides, forming a perfect square. LVPs refer to planks and LVTs to tiles. 2. What ranges and finishes are available in LVPs? You can find everything, even planks that are virtually indistinguishable from authentic wood, such as FloorworX’s EarthWerks* Tempo. This product also has extra wide planks and micro-bevelled edges. Deep embossing with a low-gloss finish also enhances the natural look. Tempo LVPs are available in six colours and are intended for commercial installations because they have a 0.55mm wear layer. In addition, we also promote Highlander LVPs, which are aimed at the residential sector. The range comes with a 0.3mm wear layer. 3. Are these installations DIY-friendly or should a professional installer be approached? For a long-lasting, aesthetically pleasing result, a professional installer is best. 4. How do you install LVPs? Each manufacturer will have their own installation guidelines. The Tempo LVPs are glue-down planks and the product must be allowed to relax on site. This means that after it has been removed from the packaging and separated into small piles, it should be left for a minimum of 48 hours at a uniform room temperature – between 18°C and 27°C – prior to installation. Be sure to use the correct adhesive for your LVP installation project. FloorworX No. 62 acrylic adhesive is the only recommended adhesive for use with Tempo LVPs. The product must be rolled in both directions with an articulated 68kg three-sectional roller immediately after it has been laid into the adhesive. 5. What are the benefits of LVPs? LVPs in general are durable, hygienic, easy to maintain and slip resistant. FloorworX’s Tempo LVPs have Tuff Shield* finish technology which makes them scratch resistant as well. 6. What TOP 5 questions should I ask a supplier of LVPs? 1. What is the use classification? 2. What are the guarantees? 3. How thick is the wear layer? 4. Is the product UV resistant? 5. What surface treatment has been applied? 7. From whom should I buy my LVPs? Partner with a company that has a long-standing reputation in the industry and offers everything from commercial to industrial products, as well as a good after-care service. FloorworX has a national footprint and after-sales service backup capabilities. 8. Do all LVPs come with warranties? What can disqualify a warranty or guarantee? Not all LVPs come with warranties, but you should always opt for a product that does. FloorworX offers a premium lifetime residential wear limited warranty and a 30 year commercial wear limited warranty against defective material on the TEMPO LVP, subject to our terms and conditions. This means the product must be installed and maintained in accordance with our recommendations for the warranty to apply. 9. Is it pet and child friendly? Luxury Vinyl Planks are very hygienic and easy to clean and maintain, making them ideal for pets and children. 10. What are the popular LVP design trends at the moment? Manufacturing processes have evolved to a point where virtually any type of material can be mimicked. A popular trend is LVPs that mimic ceramic, wood and marble. FloorworX’s most popular LVP colours are Tempo Washed Elm and Tempo Weathered Oak. Having the product installed in a herringbone pattern has also proven to be quite popular. In some cases, there is a predominant colour with an accent colour plank installed at a ratio of 90/10. FloorworX also offers the Allura Stone look LVT. This product is available in three natural stone finishes in a 500mm x 500mm tile size. For more information, contact FloorworX on Tel: +27 (11) 406 4024 or via www.floorworx.co.za.